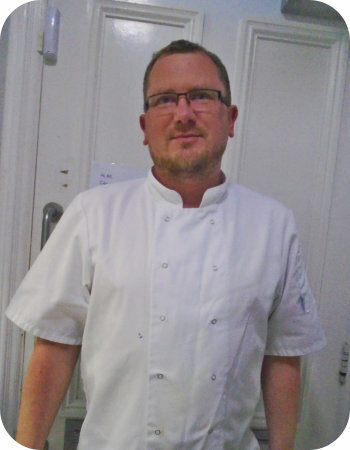 I am Jaroslaw Dabrowski, the Nursery Cook at 3 Norfolk Road. I have worked at Norfolk House since May 2016. I cook all the nursery meals fresh on site following a healthy and nutritious menu tailored to meet specific dietary needs where necessary. I understand the importance of providing children with a healthy, balanced diet. I have many qualifications including Level 3 Food Safety and First Aid, and have attended many courses throughout my career. My previous experience of working with chefs at a high level has inspired me to cook to a high standard here at Norfolk House Nursery. I enjoy working with the children at Norfolk House to help them gain a better understanding of the importance of healthy eating through a range of cooking classes in which I support them to follow recipes and cook their own meals. Fresh drinking water and fruit are always available for children whenever they are thirsty or hungry. I enjoy working closely with parents and carers. Parents are kept fully informed on a daily basis of their child’s intake of food and drink; my cooking may be sampled at Parents Evenings, which I attend; I produce recipe cards so that meals from our menu can be cooked at home; and there are meal suggestion forms which provide a constant source of fresh ideas. 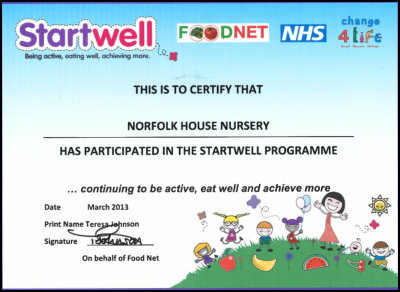 Our menus are designed with input from everyone at the nursery, and the Senior Nursery Manager has received training in menu nutrition to ensure we are providing everything children need in their meals. The nursery provides outstanding care; they offer a varied range of activities and encourage all children to participate. Food provided is always varied with all dietary requirements catered for. They are nutritious meals made by a loyal cook. My daughter is encouraged to believe she can achieve anything.